Are you interested in learning more about birds in your area, getting outside, and maybe even benefiting bird conservation and research in the process? Consider joining NestWatch, a free program of Cornell’s department of Ornithology that allows you to become a Citizen Scientist and monitor nesting birds anywhere in the United States. Once you become certified, you’ll need to start searching for nests – in bird boxes, trees, shrubs, and anywhere else bird-friendly near your home. The nest should then be visited every 3-4 days so that you can keep an accurate record of the number of eggs in the nest, when they hatch, and how many of the nestlings fledge. You can then report these data on the NestWatch website. This widespread collection of data would be extremely difficult (or impossible!) 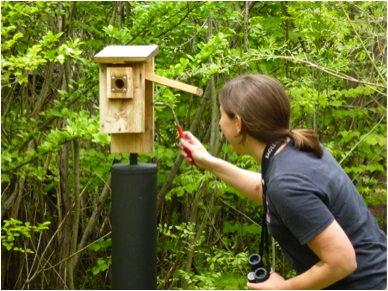 for any scientist to compile alone, and so NestWatch volunteers are truly a crucial part of this research. By reporting data to NestWatch, you’re helping scientists to understand nationwide trends in bird distribution, behavior, and response to environmental changes. Plus, you’ll be learning more about birds and strengthening your bond with the natural world by participating. Now go out and find some nests! ← Farm to Table Through the Year – Free Ebook! Thank you! That was very kind and I’m so happy that you enjoy my blog. Is there anything I need to do to participate in this nomination? What a great idea – I’m going to look into it. We watch the nests carefully around our home, but it would be nice to have an added reason! Thanks for spreading the word to help our feathered friends! Thanks for sharing this on Wildcrafting Wednesday! Hope to see you again today!